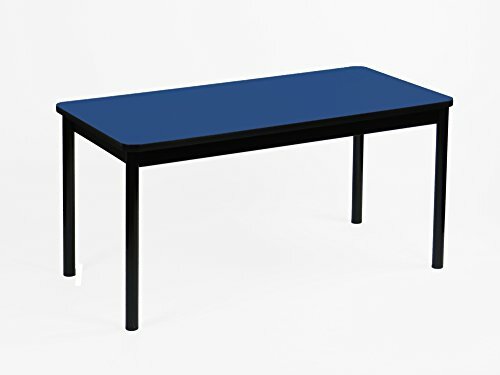 These economical Library Tables are rock-solid, with 2" diameter Round Steel Legs bolted into corner sockets in the 3" wide Steel Apron with over 3,000 pounds of clamping force. Top is High-Pressure Laminate on 1 1/8" High-Density Core with Backer Sheet. Rounded Corners to match legs. Work Surface is the same material used on kitchen counter tops. Resists Wear, Scratches, Burns, Stains, and most Chemicals. T-Mold Edge with Safety Rounded Corners to match Legs. Plastic Feet to protect all floor surfaces. clamping force. Library Tables are 29" high for the most comfortable work position while seated. Product Dimensions: 72"L x 36"W x 29"H, Top Size: 36"x72" Shape: Rectangular. Top Color: Blue. Plastic Feet to protect all floor surfaces. Rounded Corners to match legs. Frame Color: Black. T-Mold (Edge Band) Color: Black. If you have any questions about this product by Correll, contact us by completing and submitting the form below. If you are looking for a specif part number, please include it with your message.